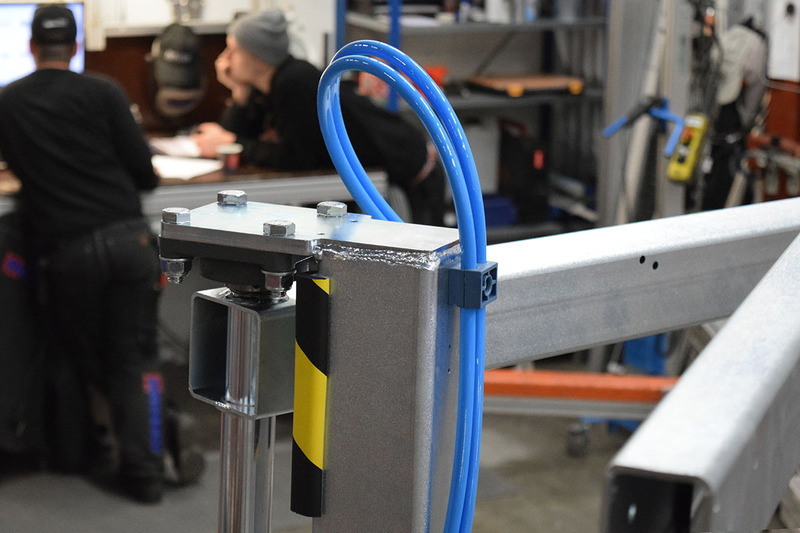 Mobile folding jib crane MobiArm™ in production – now at Movomech in Kristianstad. From 1 October, Movomech has taken over the production and sales of MobiArm™, a mobile folding crane previously manufactured and marketed by the group company Pronomic AB in Sollentuna. In connection with this change, the product has been added new features and an updated manual. • Max load is upgraded to 50 kg even at the longest jib arm length (4 m) with a mobile platform, instead of 30 kg, and up to 125 kg for the shortest arm length (2 m), previously 100 kg. MobiArm™ has been equipped with new standard option kits for electric or pneumatic media supply. In addition to MobiArm™, Movomech manufactures and markets a wide range of cranes under the Mechcrane™ brand. In addition, Movomech also offers the mobile folding cranes with a built-in balance lifter: Mechline Pro Crane™ or vacuum lifter: Easycrane™.